Innovation, exploitation… hey, what’s the difference if you’re Jeff Bezos? I read a piece in Salon about Amazon’s business model and almost throttled my friend Swamp Rabbit, I guess because he was the only creature in sight. But I was glad to see that at least one media writer wasn’t treating Amazon founder and CEO Jeff Bezos like a rock star, or calling him an e-commerce innovator. 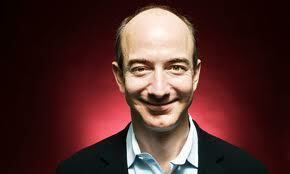 I call him a jobs killer and the overseer of a vast corporate plantation. Amazon has helped destroy countless retail jobs in its campaign to make bricks-and-mortar stores obsolete. Ironically, the mail-order monster Bezos created to replace those stores depends on bricks-and-mortar warehouses where people work for poverty-level wages at jobs much more exhausting than anything in retail. This entry was posted in down and out, economic collapse, globalization, humor, mainstream media, plutocracy, The New Depression, unemployment and tagged Amazon, bricks-and-mortar stores, customercentric, Dave Eggers, Jeff Bezos, Luddite, swamp rabbit, Walmart. Bookmark the permalink. Right on. We’ve been boycotting Amazon for a long time now. My grandfather, who was a retailer, once said to me, “Always take your trade to the local man.” And I’ve never forgotten it.